There is another module, called a Jumper, appearing in the UK that is like the IRangeX plus. I'm chasing up what the hardware and firmware is, since it is clearly modified from the Github sources, and under GPL3.0, the revised sources should be made available. I have an X9E with a BT module, and two more modules loose. I'm investigating what the situation is with these. I can’t ever thank you enough Mike for all you’ve contributed to the diy crowd since coming onboard! The educational part alone is priceless in my case! I have been told, by FrSky, that the BT module, sold as a spare for the Horus, ships with the correct firmware installed. Ouch! Good news but why don’t I see it as a trainer option in otx2.2.1? It really looks soldered in correctly. What I haven’t done is measure the vcc pad. No idea if it powers up or down when selected if it was to show up? Is it possible some other SMD components are missing not being the S main board? The statement was made that otx looks for the Bt module and only shows it if present? This may be from MikeB? In any case, it’s more info to look at. 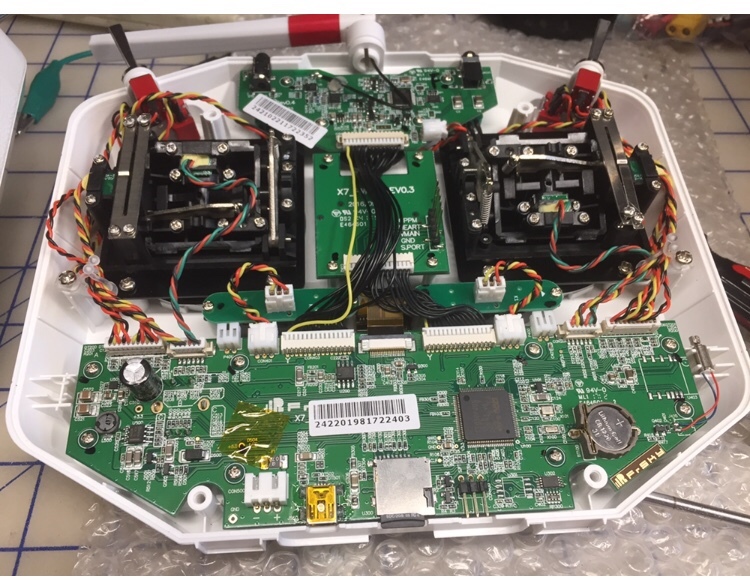 I note that the X7 doesn't have connections for RTS and CTS tracked to the module pads, unlike the Horus. This lack may prevent the module from responding as expected. I've got a debug serial port running on my prototype Horus, and will be running some tests over the next few days. That may be the missing link so to speak Mike, no connections. Easy enough to add if I know where they go on the processor or wherever? I installed Modules in both my x7’s so I can’t see the trace under the pads for now. I can remove a module however if needed for verification of anything if a ohm meter isn’t enough. Got to love that smd microscope I believe we both own. I’m also open to using ersk9x for troubleshooting if it save time. It seems I took a pix of my x7 mainboard some time ago, before I installed the Bt board. It does show trace to the pads going somewhere? The Tx and Rx signals are on pads 16 and 17. 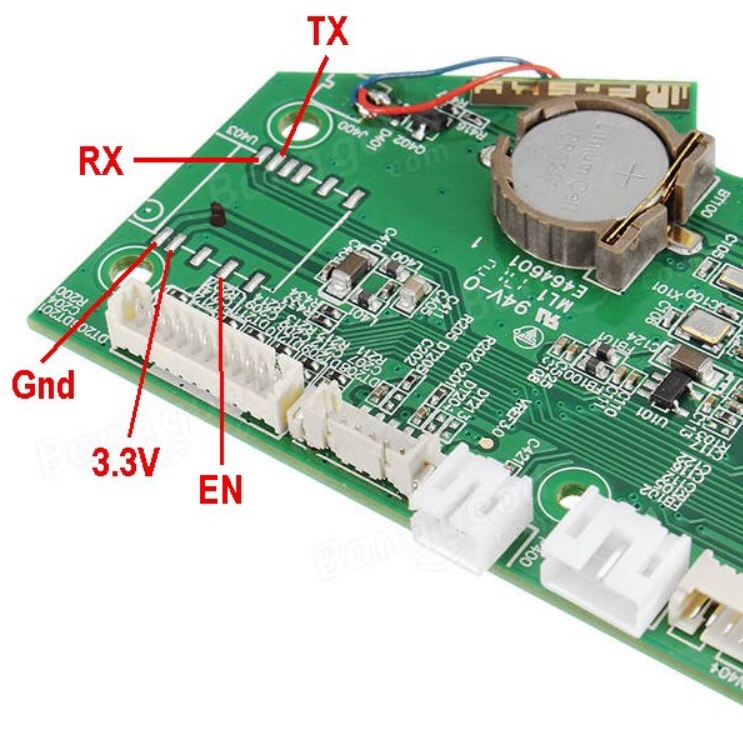 RTS and CTS connect to 14 and 15, and there are no traces connecting to them, nor are there any connections shown for them on the circuit diagram. There aren't reeally any 'spare' signals on the processor for these functions either! MikeB wrote: The Tx and Rx signals are on pads 16 and 17. RTS and CTS connect to 14 and 15, and there are no traces connecting to them, nor are there any connections shown for them on the circuit diagram. So does that mean the mainboard are too different to make this work? Sorry for being slow on what I’m reading Mike. That may be the case. However, I'm looking at the HM-10 bluetooth module. This comes packaged like the HC-05, but is BT 4.0 LE, and may be software compatible. I have one on order I expect to arrive in the next few days. There are "clones" of this module around, I have 2 of them. The commands are a bit different though. I have these two clone modules in a couple of 9XR-PROs, and they are "sort of" working. The possible throughput is lower than the HC-05 (BT 2.0) modules so I need to reduce the total data I'm trying to send. They also seem to be biased to send more data from the "slave" to the "master". If anyone is looking to get a HM-10 module, make certain it has the "extra" crystal fitted so it is a real HM-10, not a clone. The HM-10 module should work without needing the RTS and CTS signals. I need the next few days to check everything out. In general, the BT 4.0 LE doesn't support a serial protocol, so on the computer any connection doesn't show up as a virtual serial port. This requires some new code to "discover" any connected device in an application, and then "talk" to it. I've still to find out exactly what is possible on windows. Mike, as you know, I have two modules.. but I think they are clones.. will check in the morning. My plan is to get this "real" HM-10 module and check to see if it and the FrSky module do use the exactly same serial commands. If they do, then I should be able to add support for them to ersky9x, and a HM-10 module should also work in a QX7 as standard. I have the instructions, and firmware file, that should allow a CC-41 (HM-10 clone) to be flashed to be a real HM-10. If the above all works, then I shall try to re-flash one of my clones. Thanks.. having the clones working would be nice because they are much cheaper than the original which are a bit more difficult to find also. Actually, many sellers do sell the clones as originals, so we never know what we are getting. Can someone tell me what's the benefit about using bluetooth 4.0 LE over bt 2.0? It is supposed to be faster, perhaps file sharing between radios, which would be great for sharing models, sound files, firmware files, etc. At the moment, it seems that there are also disadvantages. As mike said above, and as far as I understood, it seems they are not able to do serial communication with a PC without having a driver written for it. I have the HC-05 in all my radios, and I am very happy with it. Specially being able to communicate with eepskye and program my models using it from the PC, ans see real time what the model does. I find it easier to program the model from scratch on the computer instead of the radio..
No, not faster, LE stands for "Low Energy". It is designed more for battery powered equipment, so uses less power. Less power then tends to give less throughput. As I understand it, it is intended more remote sensors that send small amounts of data at frequent intervals. When I've tried the two clone HM-10 modules, they didn't manage the same throughput of the wireless trainer data I send as BT 2.0. Ok, thanks Mike. I thought they allowed for faster data transfer. Obviously it might not be the case then. Does that mean that the HC-05 could be able to do file transfer between 2 radios for example? If that is the case I wouldn't even consider replacing them with the HM-10. File transfer between radios is perhaps the only reason I would consider the new ones. But if the HC-05 can do it also, I won't bother, also because I don't want to lose the serial communication between radio and PC. This is also very important to me..
My interest is still to see how the Frsky Bt module if it ever works, works reliably between Frsky tx’s that are advertised to come equipped with them. That’s the most common setup I’ll see at my club field. Not many diy’ers in the fixed wing flyers. One close friend is buying a Qx7 s from Aloft today so I’ll be there’ll be one to try if my x7 Bt module will ever work. Basically I’m trying to do the beta testing on the Frsky Bt that never was talked about and only mentioned in all the fluff YouTube videos. Not one actually shows it working or how well, that I can find. A bit of progress. I'm testing the BT module in my prototype Horus, I have a driver working in ersky9x and I'm getting some sensible responses from the module. My 'real' HM-10 should also arrive tomorrow. "BLE is not an upgrade to Bluetooth Classic, it is a different system with different intended uses. BLE works in a very different way to the earlier Bluetooth. BLE is designed for low energy applications and achieves this by using infrequent small packets of data. It is not really designed for continuous connections and large amounts of data. For this, Bluetooth Classic is a better choice." I've now got my "real" HM-10 module. I've plugged it in to a 9XR-PRO and have it responding to serial commands. As I understand it, the module in the Horus won't "talk" to the one in a X9E. It currently doesn't find it, nor does it find the HM-10 clones (CC-41) I have, I haven't yet tested it finding the HM-10. The HM-10 doesn't find the Horus module in normal search, but does find it using a special "All" search. I'm continuing to test and investigate. If they say it is not good for long connections, then it is useless for trainer, and also connecting to eepskye. Mike, could for example file transfer between 2 radios be achieved with the HC-05? This is the only Bluetooth feature that we still don't have, I think??? As I understand it, the module in the Horus won't "talk" to the one in a X9E. They are physically identical but run different, incompatible firmware. The X9E module can be reprogrammed, but it is a bit of a pain becasue it does not even have a bootloader. So the bootloader must first be flashed, then the application firmware. 2 of us have done it successfully so if you want to go that route I can give you the bootloader file that is a pain to obtain (haven't found binaries, source is available in TI's CC SDK but needs installing a whole toolchain to build). I may go down that route since the X9E module doesn't seem to be found by my HM-10, so doesn't seem to be at all useful. Thank you for those, I'll get round to doing this in a while. I finally got my hc05 board and I wanted to modify it as shown in the other post, but I have another board for some reason. What trace do I have to cut on this board or maybe I don't have to cut anything? I've got it working sucessfully without cutting anything as slave with lcd bump, but I have no other radio to test it with trainer. I can rename it. Seems like that board is working fine, without needing any mods done. Regarding BT 4.0, I have my HM-10 detecting the BT module in a Horus. By default, they are using a different "UUID" value, so don't immediately communicate, but the HM-10 includes a command to change the "UUID" value, so I may get them to "talk". I need to add a facility to allow the "UUID" to be selected though, then handle the (slightly) different commands to the different type of module. Last edited by ronny1407 on Thu Mar 01, 2018 9:38 pm, edited 2 times in total. Are you able to test this module in the trainer mode to another Tx with a BT module from FrSky? In particular, it seems you are testing it in 'slave' mode. Does operate in 'master' mode and find and connect to a FrSky 'slave' module? In 'slave' mode, is it found by a FrSky 'master' mode module. When using a HM-10 module, I've found it is using a different "UUID" value that means it doesn't 'talk' to a FrSky module.